so danca social dance shoe by Scottish Dance Shoes | Wedding Shoes by Scottish Dance Shoes | Bridal Shoes by Scottish Dance Shoes from Arabesque. 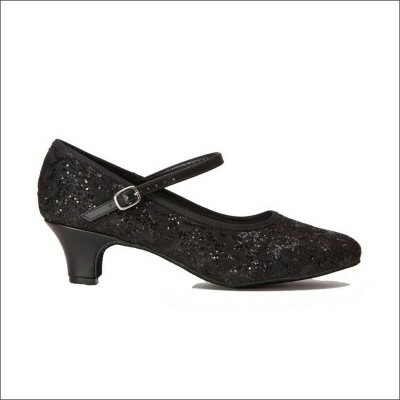 If you're looking for an elegant but practical shoe for social dance classes, a ball or ceilidh then these are perfect! Made by So Danca in Brazil, the leather covered heel gives just enough height without losing stability with a durable flexi suede sole for effortless turns. Sparkly black fabric upper with a cotton binding to stop snagging on your tights and adjustable strap. Plus the cushion padding will keep you on the dance floor for hours!